Cook the brown rice in boiling water for 35 minutes, or for the time stated on the packet instructions, until tender. Once the rice is cooked, drain well and allow it to cool. While the rice is cooking, heat 1 tbsp oil in a nonstick pan over a high heat and sauté the chicken for 3–4 minutes until golden. Ensure that it is cooked through. To make the dressing, combine the remaining oil, vinegar and garlic and season with salt and freshly ground black pepper. 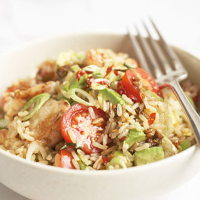 Transfer the rice to a serving bowl, stir in the chicken, avocado, salad onions, tomatoes and chilli flakes. Pour over the dressing and toss thoroughly.